Small and medium business worldwide looking for a flexible phone solution to simplify customer support and sales activities. 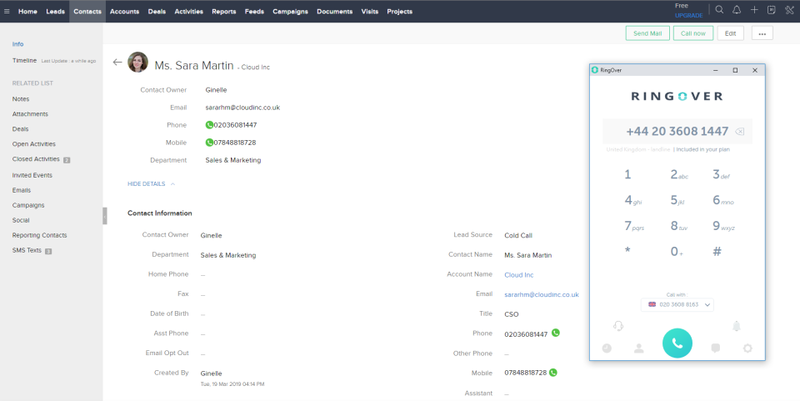 RingOver: the 100% cloud-based phone system for small and medium businesses. We combine excellent voice quality with a super-user-friendly interface accessible via the web and mobile app. Set up an on-site or remote call-centre in 5 mins. Obtain numbers in 65+ destinations to enjoy unlimited in & outgoing calls. 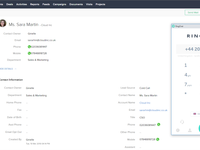 Benefit from call data-syncing, click-to-call, call supervision, call recording, after-call management, call logs, journeys and detailed real-time analytics. Free trial. Pros: I like RingOver's support team because it is amazing and responsive. It is a quality and an affordable software for unified communications. Due to the efficiency of RingOver, I can highly recommend it to others. Cons: RingOver has no notable flaws because it has been of benefit to our business since we began using it. I like its easy to install and run features a lot. Overall: This tool deserves a five star because my experience with it since day one has been excellent. Your review made our day, Marcus! We agree with you - our support staff are next to none! So good to know that we can help your business achieve success and we look forward to working more with you :). Reviews after 1 year: everything is perfect ! Pros: I have had no issue using the web app from my desktop. You can make free calls if you dont have big needs and more tools, more set ups. Overall: The user interface is very friendly and call quality is very good. This review made our day! Thanks for sharing your wonderful experience with us and everyone else reading. We have really big things in store in terms of new features and quality enhancements so hold tight - it only gets better! Pros: Easy to use, and a very great customer service. CSR was great and very attentive. Also the APP is very nice to use. Cons: Sometimes I have problems with the conexion. Only that. Overall: The calls are quality. Sometimes to some places there is a little bit of lag. But I am very happy with the experience. Thanks for sharing your thoughts on RingOver! We are glad to know you had a great experience working with our customer support personnel.Your feedback makes it even easier for us to continue improving our service quality so thanks again for that! Looking forward to working more with you in the future! Pros: Call logs are useful and well organised. Ability to monitor and record calls has proved invaluable. Cons: So far.everything is working exactly as we need it to. Overall: The support service has been second to none. Unified Communication. RingOver is Turning Things Around. Pros: The software is very easy to use, and one can have it on phone through an app, or from web. RingOver facilitates free calls, and this lowers the communication cost. 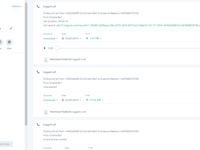 Finally, one is able to monitor their call logs easily. Cons: Complaining about RingOver is a wrong thing. This software is a five star product. Very helpful. Overall: The cost of communication has been slashed to zero. Great tool for firms to consider. Cons: The service should be all-inclusive across all countries rather than a select few landlines. Pros: It is very easy to use, perfect for my business and excellent customer service. Overall: I can share all my contact and call with my colleagues. In case I m not available , someone else will attend the call and the customer will not have to call to another number. Hello Noemi, thanks a lot for sharing your thoughts on RingOver. We are very happy that we can help your customer service team deliver value to your clients! We will be improving our website soon so you can have a better experience. Keep up the great work and we look forward to continue working with you!